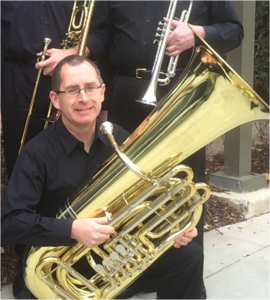 Toby Halliday has played Bb tuba with the Band since 2009. Toby is a native of Napa, California and attended U.C. Berkeley, where he performed on trombone with the U.C. Jazz Ensemble and the Cal Band under the direction of Robert O. Briggs. Toby holds a Masters of Public Policy and has primarily worked in affordable housing and community development programs and policy since he moved to the DC area in 1986. Toby has also performed with the concert band of Northern Virginia Community College, the Georgetown University Orchestra, the Montgomery Symphony Orchestra, and several brass quintets.